Posted on July 30, 2011 by Deli Lanoux, Ed.D. At that moment I realized that I knew nothing more about the day’s significance. I mean, I had wondered but I just hadn’t made the time to learn more about it. 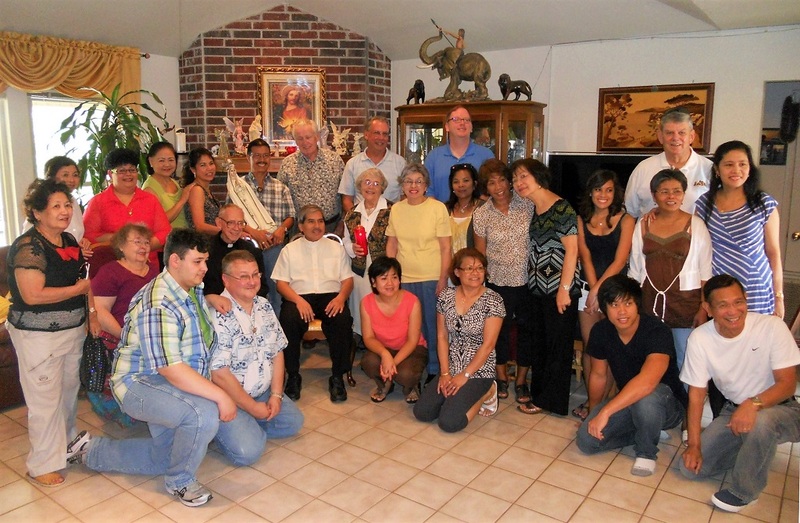 Every first Sunday in May Sam and Ning, part of our church family from St. Paul’s, host a pilgrim rosary at their home to celebrate Sam’s birthday and their wedding anniversary. They are such a popular couple that their house quickly fills with close friends and friends of friends, interesting people involved in the various ministries. This time around Steven and I met another of Sam and Ning’s friends and his guest, Father Tito— white shirt on the right— a SOLT missionary from the Philippines. The more we talked the more Father’s quick wit impressed us but, when he mentioned his blog? Oh, my gosh. I knew that his zeal for challenges had bonded us for sure. And, when he stated his genuine interest in switching his blog to WordPress and asked if I’d be willing to tutor him, I teasingly elevated him from spring chicken to pollito to padrecito— the latter my term of endearment for him that in (the lisped) Castilian Spanish sounds like Padre Tito. So, two months later when Father called with his invitation to the Sisters’ celebration at the cathedral, I didn’t know how to tell him that we’d already made other plans. I knew he’d be disappointed regardless of what I said, so I eased into my explanation by thanking Padre Tito for his thoughtfulness. Padre Tito and I agreed that there’s always next year and conversed a while longer until Father’s very long day took its toll. Then we quickly bid each other well, blessed each other, and said goodnight. The following morning in Brownsville, we drove down Alton Gloor and passed the future site of The Lord of Divine Mercy Church where we’d seen the groundbreaking preparation— tarp, chairs, fresh mound of soil— exactly one week before. St. Mary’s, but I still remembered our meeting clearly. Hurricane Rita had been en route to the Texas coast that afternoon, but I’d shown up anyway for the meeting about the new church and had remained until Father had determined that no one else would be attending. Then we’d gone our separate ways and hadn’t seen each other since. Still, I’d occasionally wondered about the progress of the church. All week we’d eagerly awaited Saturday evening Mass at the elementary school cafeteria on the opposite end of the road we were traveling. All week we’d asked (pondered) the same questions that come up every single time we’ll be at a church other than ours. Will the church members be friendly? Inclusive? Will we like the place enough to revisit? To be parishioners? 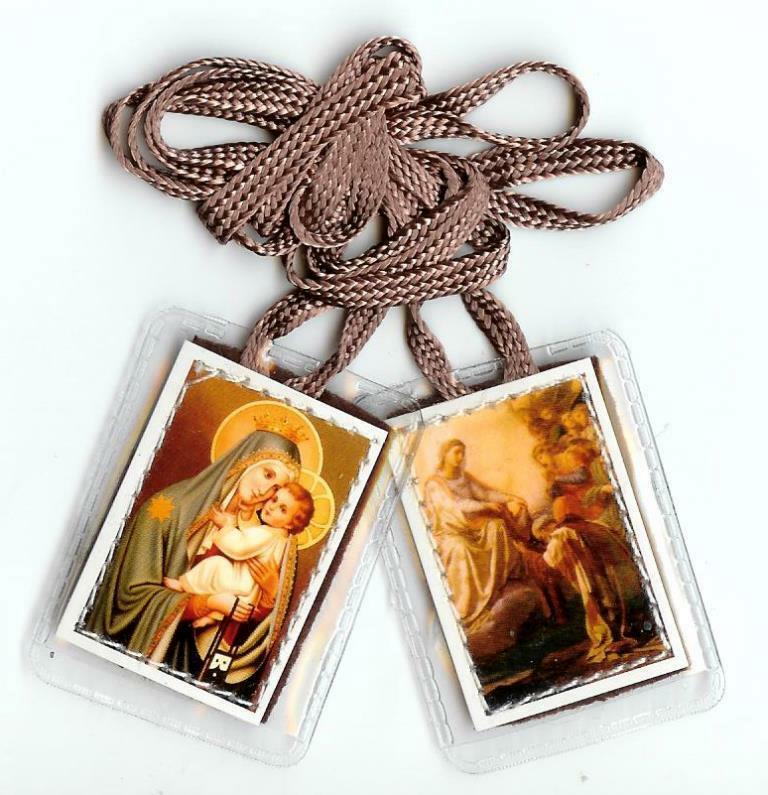 After Mass a young woman, Laura, gave us a brown scapular and a two-page printout to commemorate the feast day of Our Lady of Mount Carmel. One comment led to another and soon we were talking nonstop as Laura continued to dole out the lovely treasures to parishioners and visitors exiting the school cafeteria. 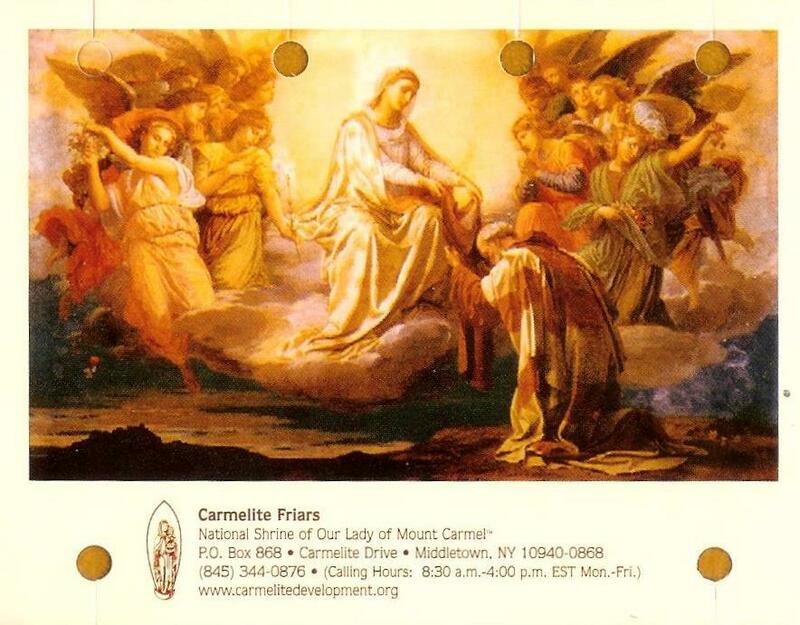 Unexpectedly, Our Lady of Mount Carmel had touched our lives even before the brown scapular had introduced us; so I told Laura about Father Tito’s invitation to the nun’s final promise, and she told me about her work within the church. 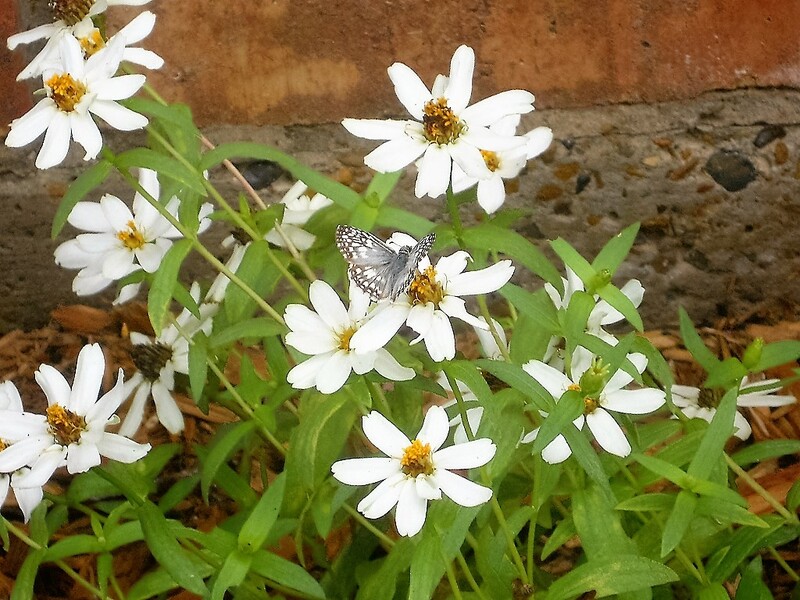 “Our meeting was no accident,” Laura kept insisting. We agreed to stay in touch, since Laura’s gathering resources for her ministries. Then we spoke with Eddie, whom we’d met before Mass. Such nice folks, I thought. Eddie, Laura, and a couple of others with whom we’d interacted had certainly made us feel welcome. 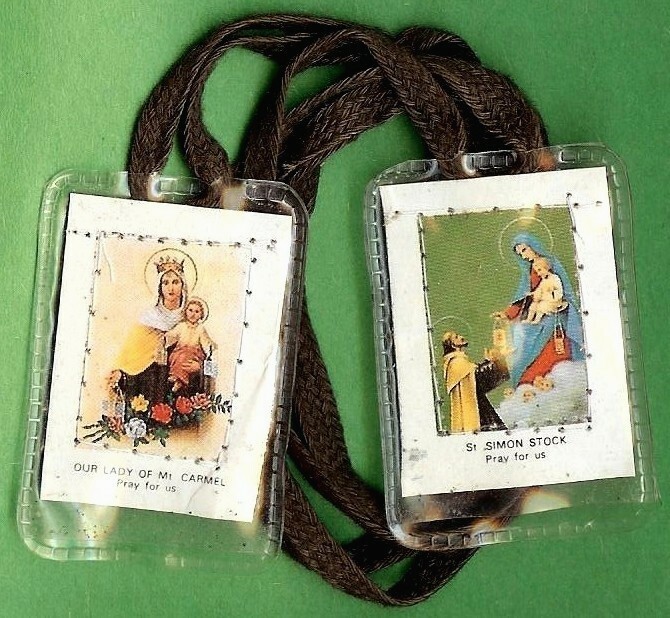 And I was tickled pink for the special mementos— the scapular and the prayers— from our time together at Mass that evening. Having said our goodbyes, my mind raced to a long ago Christmas gift from mom, a sturdy floral box that holds my prayer cards and other such keepsakes, on the floor by my computer desk. 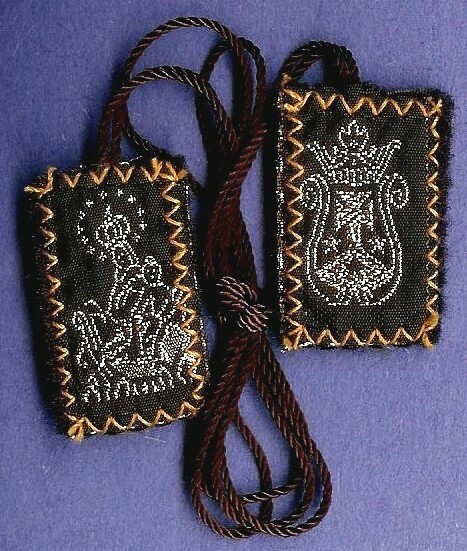 I could hardly wait to look through my stash for the brown scapular I’d stored away since mom bought it for William’s first communion in 1984. To have had this very special promise in my possession all these years and not know anything about it until Padre Tito and Laura came along was simply incredible. 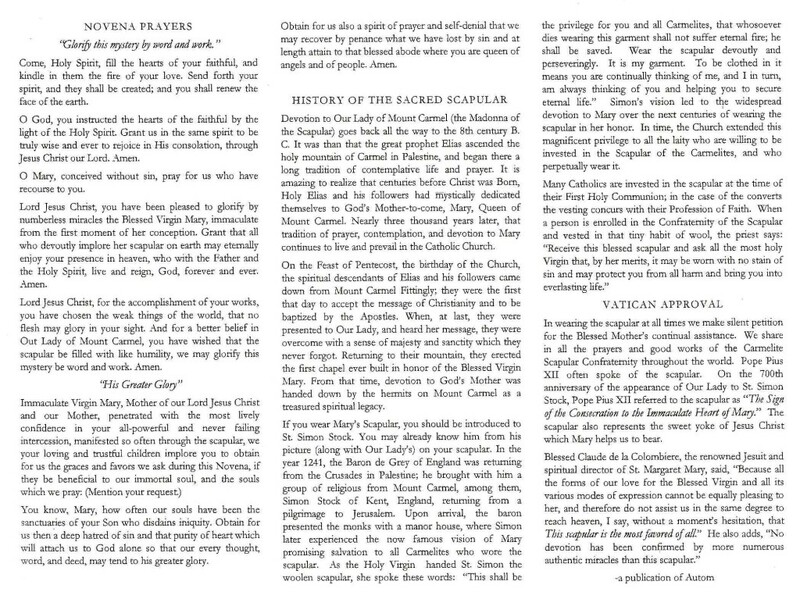 Flos Carmeli… O beautiful flower of Carmel, most fruitful vine, splendor in heaven, holy and singular, who brought forth the Son of God still ever remaining a pure virgin… assist me in this necessity. O star of the sea, help and protect me! Show me that you are my mother. O Mary, conceived without sin, pray for us who have recourse to you! 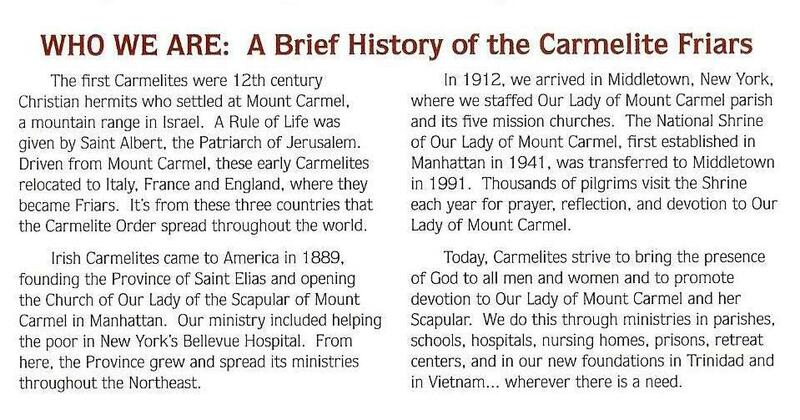 Our Lady of Mount Carmel… Most beautiful flower of Mount Carmel, fruitful vine, splendor of heaven, Blessed Mother of the Son of God, Immaculate Virgin, assist me in this my necessity. Star of the sea, help me and show me that you are my mother. Holy Mary, Mother of God, queen of heaven and earth, I humbly beg you from the bottom of my heart to help me in this necessity, as there are none that can withstand your power. Show me that you are my mother. 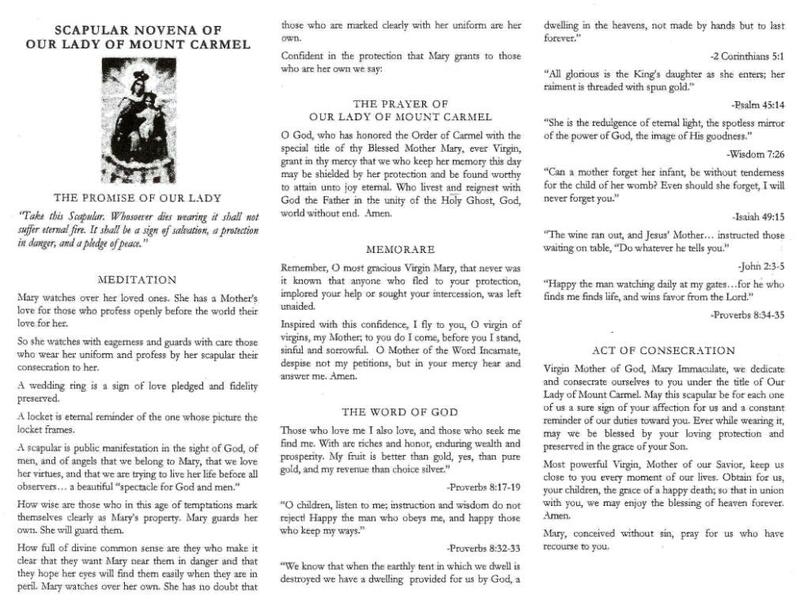 Queen and Beauty of Mount Carmel, Virgin of the solitude, in the wilderness of Carmel lies the world’s eternal good. Draw us to its deep seclusion and make God alone our goal in the mystical Mount Carmel that lies hidden in the soul (Sr. Miriam of the Holy Spirit, OCD).